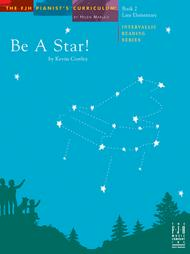 Be A Star!, Book 2 (NFMC) composed by Kevin Costley. Edited by Helen Marlais. For piano. Instruction. Intervallic Reading Series. This title is on the 2011-2012-2013 National Federation of Music Clubs list.. Late Elementary. Book. Published by The FJH Music Company Inc (FJ.FF1581).ISBN 1-56939-493-8.The Intervallic Reading Series provides supplemental repertoire that allows students from all backgrounds and methods to benefit from playing interesting pieces which emphasize intervallic reading. This late elementary addition encourages students to read.